If your German shepherd’s compulsive tail-chasing is enough to make you dizzy, know that you are not alone. This breed is almost as well known for merry-go-round-style circling as it is for strength and intelligence. It may seem like a cop-out to blame flaws in the family tree for all bad behavior, but in the case of tail-chasing, it can actually be true. In her book, “The Dog Bible,” pet wellness writer Tracie Hotchner notes that tail-chasing has a genetic aspect. 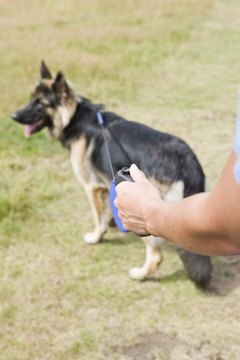 It is widely recognized that German shepherds are predisposed to chasing their own tails, while other breeds are prone to behaviors like excessive licking or snapping at imaginary pests. Animal researchers aren’t certain why these behaviors appear more often in certain breed lines, but the evidence lies in the sheer volume of reported cases. If we sometimes need therapeutic measures to rid our minds of nagging issues, it stands to reason that dogs do, too. Sometimes, what started as a response to a single instance of anxiety or frustration becomes a pattern of behavior, writes veterinary behaviorist Bonnie V. G. Beaver in “Canine Behavior: Insights and Answers.” This is especially true if the shepherd is repeatedly exposed to stress-inducing situations, like confinement, lack of stimulation or physical abuse. Relieving anxiety in a dog starts with helping him release pent-up energy. Lots of exercise tires out an anxious canine and eases compulsive behaviors. Long-term training will also mean providing ample distractions for the dog to divert him from spinning, plus positive reinforcement for good behavior. If a German shepherd seems unwilling -- or unable -- to be distracted from tail-chasing by any other stimulus, it’s time to examine other possible causes. Our dogs, ourselves; there’s really not much separating man from man’s best friend. A 2012 report in “Wired” magazine noted that tail-chasing is remarkably similar to the rituals humans with obsessive compulsive disorder, or OCD, exhibit. That report discussed research in the journal “PLoS One” on canine compulsive behaviors. The researchers found that many pet owners reported an onset of compulsive behavior in puppies between the ages of 3 and 6 months old, and that puppies separated from their mothers or not well cared for were more likely to exhibit tail-chasing. When it comes to treatment, nutritional supplements have helped reduce the severity and frequency of tail-chasing episodes -- and that may spell relief for worried pet owners. Veterinarians sometimes also prescribe antidepressants, which have shown promise in pharmacological studies. Interestingly, tail-chasing and circling behaviors are connected, so affected dogs don’t always run around and around in small circles. Some pups wander repeatedly in a larger circle, or they may even trot in compulsive figure-eight shapes, according to veterinary behaviorist Nicholas H. Dodman in his book “The Well-Adjusted Dog.” The American Society for the Prevention of Cruelty to Animals notes that, in extreme cases, German shepherds can become so compelled by chasing that they begin to self-injure through biting or gnawing at the tail. When it comes to tail-chasing, Dodman also describes German shepherds as “a law unto themselves,” noting that the breed doesn’t always respond to treatment the way other breeds, like bull terriers, do. Researchers like Dodman have theorized that tail-chasing could have an underlying neurological cause. German shepherds are susceptible to epilepsy, so seizures are a top suspect. These conditions need formal investigation and treatment by a veterinary professional.